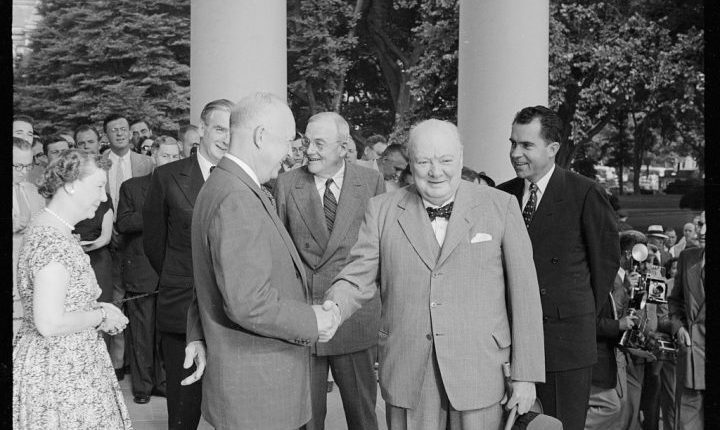 Above: Nearing 80, Churchill arrives for a visit to Washington, 25 June 1954. L-R: Mamie Eisenhower, British Foreign Secretary Anthony Eden, President Eisenhower, U.S. Secretary of State John Foster Dulles, Vice President Richard Nixon. At sixty-five—an age much older then than it is now—Churchill became leader in a seemingly hopeless war with Nazi Germany. At times he found himself fatigued with the stress of it—yet somehow he found the inner strength to soldier on. We rightly admire his ability to hold fast and never despair. But what were his sources of physical resilience, mental hardiness and spiritual strength? Great figures have personal trials and tribulations like everybody else. We sometimes overlook this. It seems that they have magical powers or special insight into coping with stress. With Churchill, we may imagine that he was immune from things that wear down ordinary people. He was not. But he did develop strengths in his formative years which he was able to build upon in great crises. This forged a physical resilience and mental hardiness, the sinews of a personal toughness, which stood him in good stead throughout the Second World War and beyond. His physical and mental characteristics formed a subtle interplay that shaped Churchill’s personality and response to challenges. Still, these are components of many a healthy person. We each develop responses to life’s stress and, unless devastated, we usually rebound. Our effectiveness comes from both genetic makeup and acquired capacity to cope. How “nature and nurture” combine to form human response mechanisms remains the subject of speculation and controversy. The first quarter century of his life saw numerous illnesses and accidents, none of which were serious enough to incapacitate or handicap him. His first premiership, 1940 to 1945, was a significant transition period. Braced by the battle, his hardiness waxed. He appeared to be not only indomitable, but also apparently indefatigable. He had reached an age when most persons retire, when physiologically, their vital forces begin to decline. Yet Churchill tackled the greatest task of his life, the most fearful and intense war in history, with verve and zest. He maintained a work schedule which would exhausted an ordinary man. Indeed he wore out some of his colleagues and contemporaries. He may have suffered a heart attack during those years, and had three bouts of pneumonia which in earlier days would have permanently disabled if not killed him. It didn’t matter. After recovery from each bout of pneumonia, he maintained a grueling work schedule with few periods of rest and relaxation apart from his regular afternoon nap. Of course, Churchill was not the only war leader who had to bear up under great duress. When, in early 1945, he met Stalin and Roosevelt at Yalta, he was as feisty as ever, no doubt invigorated by another “meeting at the summit.”6 Alas Roosevelt was “the sick man at the table,” as his critics said. And by virtue of being the only head of state, FDR always presided. Even Churchill’s staff noticed the President’s failing health. “He sat looking straight ahead with his mouth open, as if he were not taking things in,” wrote Churchill’s doctor. “Everyone was shocked by his appearance.”7 Churchill might not have been at his best at Yalta, but he was able to discern the flow of events and predict the likely outcome, while remaining unable to influence a better result. “Man goeth forth unto his work and to his labour until the evening,” Leslie Illingworth in Punch, 3 February 1954. Questions about the PM’s fitness dogged his final premiership. 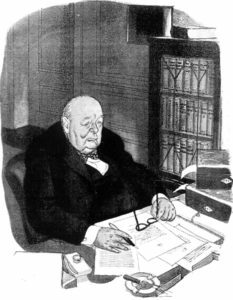 Critical editor Malcolm Muggeridge ran this heartless cartoon showing a listless PM, his face registering the effects of a partial paralysis he had suffered the preceding summer. Illingworth usually drew admiring cartoons. Churchill said: “Yes, there’s malice in it. Look at my hands—I have beautiful hands. Punch goes everywhere. I shall have to retire if this sort of thing goes on.” Yet he stayed on for another fourteen months. Appearances can of course be deceptive. Churchill was always stirred by some momentous event or, very late in life, by the memories of it. Yet despite his towering image, from a medical standpoint he was as human as any of us. If he had been merely ordinary, his medical history would be of little interest to anyone except his doctors—assuming that as an ordinary man he would have had the luxury of a personal physician. At the sunset of his life he was less buoyant. Yet there can be little or no doubt about his essential physical resilience and mental hardiness. There are many lessons to be learned from his tenacious spirit and determination. The biggest is to react as he did to challenges. His would have felled many a lesser man. The truly great do not wilt when faced with such odds. They revel in it, they strike out against it. Thus Churchill struck out at tyranny. His record, and the memory of it, invigorated him, and he fought on. 1 Speech to the Canadian Parliament, Ottawa, 30 December 1941 in Richard M. Langworth, ed., Churchill by Himself (London: Ebury Press, 2012, New York: Rosetta Books, 2016), 8. 2 Speech at Harrow School, 29 October 1941, in Churchill by Himself, 23. 4 Churchill by Himself, 510. 6 Churchill’s term for plenary meetings between top leaders, beginning at Teheran in 1943. Churchill by Himself, 311. 7 Lord Moran, Winston Churchill: The Struggle for Survival, 1940-1945 (London: Constable, 1966), 218. 8 Churchill by Himself, 522. 9 Winston S. Churchill, The World Crisis, Vol. 2, 1915 (London: Thornton Butterworth, 1923), 371. 10 Churchill by Himself, 20. 11 Andrew Roberts, Churchill: Walking with Destiny (London: Allen Lane, 2018), 867. Dr. Mather is archivist-historian of the Churchill Society of Tennessee, and has spent many years researching Churchill’s medical history.